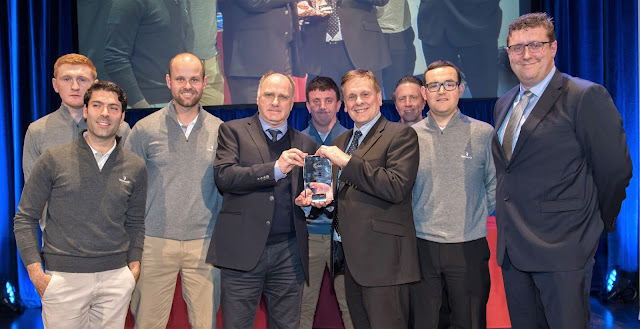 The greenkeeping team at Deeside Golf Club in the Aberdeen suburb of Bieldside is celebrating after being crowned BIGGA Awards winners at BTME 2018. Led by Course Manager Neil McLoughlin (41), the greenkeeping team were announced as the winner of the BIGGA Greenkeeping Achievement of the Year Award sponsored by Baroness, at a ceremony held this evening in the Harrogate Convention Centre’s Royal Hall. When Storm Frank hit Aberdeenshire the day before New Year’s Eve in 2015, it caused the River Dee to reach record levels, three times covering the course in a thick layer of silt and debris (picture above was taken at the time of the flooding). In the aftermath, the team was able to get 10 holes reopened after just 77 days and the clean-up saw over six tonnes of grass seed laid down, 10,000m2 of turf laid and all 98 bunkers rebuilt, using 3,000 tonnes of sand for topdressing and bunkers. During 2017 the hard work continued, with the silt layer impeding drainage. Over 400m of drainage was installed and a programme of scarification and topdressing helped break down the silt layer further. The Deeside team was presented with the award by television presenter and #ThisGirlGolfs ambassador Naga Munchetty at the BIGGA Welcome Celebration sponsored by Textron Golf. The awards ceremony is one of the highlights of BTME 2018, the premier turf management exhibition in Europe. Neil said: “It’s a real honour to win this award. 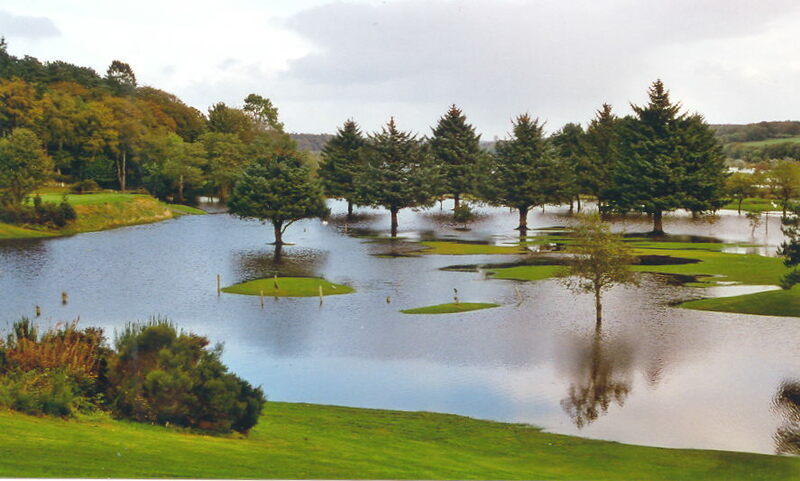 Storm Frank came in and devastated the whole Dee Valley and the golf course ended up in a hell of a state. BIGGA Chief Executive Jim Croxton said: “Of the golf clubs who were hit hard by the devastation that Storm Frank wrought in December 2015, it was perhaps Deeside who were hit hardest of all. The greenkeeping team at The Wentworth Club in Virginia Water, pictured above, has been recognised for its incredible performance in preparing the course for the BMW PGA Championship 2017 with the BIGGA Championship Performance of the Year Award sponsored by Rigby Taylor. The redesign of Wentworth’s famous West Course was conducted by European Tour Golf Design, with the support of Ryder Cup captains Paul McGinley and Thomas Bjorn and the Ernie Els Design group. But it was Director of Estates and Golf Courses Kenny Mackay, a Scot, and his team who were responsible for ensuring the changes were implemented ahead of the BMW PGA Championship in May 2017. All 18 greens were stripped of the old turf and re-seeded with a new creeping bent, while four greens – on the eighth, 11th, 14th and 16th holes – were completely rebuilt. A sub-air system was also installed on all the greens, while new drainage and irrigation was introduced. Furthermore, all the bunkers were redesigned and reconstructed, with 29 completely removed from play. Kenny accepted the award from Chris Clark, chairman of the Rigby Taylor sponsoring company , at the BIGGA Welcome Celebration sponsored by Textron Golf, held tin the Harrogate Convention Centre’s Royal Hall. The awards ceremony is one of the highlights of BTME 2018, the premier turf management exhibition in Europe. Kenny said: "It's a very close-knit team. The big challenge we've seen is preparing the greens from tournament.